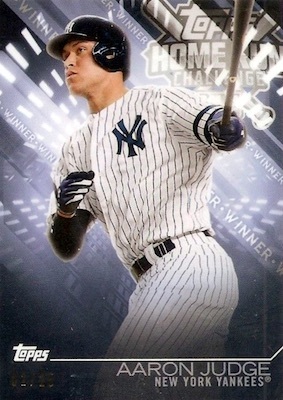 Product Details Although it's not the same as popping a dinger yourself, the 2018 Topps Home Run Challenge promotion treats baseball fans to a little fantasy excitement as they predict future home runs, with prizes available for the correct guesses. 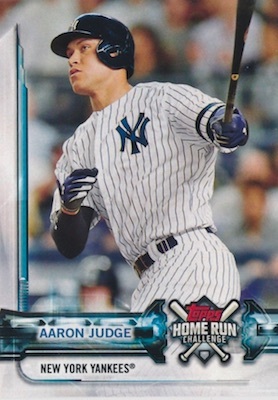 Slated to fall at 1:36 pack odds across hobby and retail (with the exception of dollar stores), the 2018 Topps Home Run Challenge checklist is comprised of cards issued in three different products. 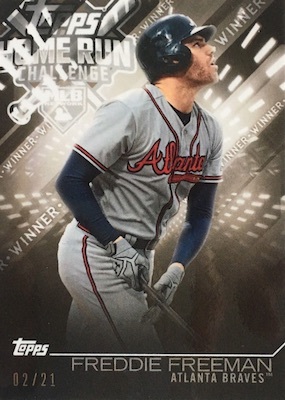 First is 2018 Topps Series 1 with 50 cards featuring the Home Run Challenge logo and #HRC prefix. Building on those choices, additional sets come in 2018 Topps Series 2 (June) and 2018 Topps Allen & Ginter (July). The A&G releases are a little easier with listed packs odds of 1:24 packs. Okay. 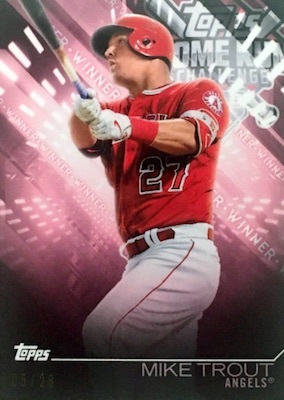 So you have the 2018 Topps Home Run Challenge baseball cards. Now what? Fundamentally, the 2018 Topps Home Run Challenge gameplay is pretty simple. Turn over the card to find a scratch-off section. 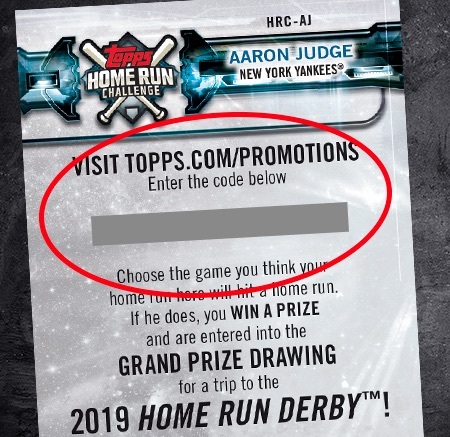 This reveals a number which you add to your Topps.com account along with your guess for the exact date when the player on the card will hit a home run. The act can either be a traditional home run or an inside-the-park home run. Those collectors who choose wisely win a free parallel card for the depicted player. There are different parallels for each month of the promotion, and you can continue to enter guesses for the same player(s) as long as you have unredeemed codes. The 2018 Topps Home Run Challenge game does have several rules to be aware of before you enter. First, once you confirm a date, your selection is locked. Also, if the player is injured or the game is postponed on the date selected, your chance to win a parallel is gone. And, no matter how many home runs are hit by the player on the date, you can only win one parallel per submission. But you can apply multiple codes for the same player to the same date, if you want. That might be an ideal move if you know a doubleheader is happening. Topps does allow submissions to be finalized up until 11:59 PM (Eastern) on the day prior to the date in question, so collectors can still be fairly certain their player will at least be active. In addition, every redeemed code is entered in a monthly raffle for various Topps prizes, such as autographs or memorabilia, and entered in the raffle for the grand prize. For one lucky collector, the grand prize is a trip for two to the 2019 MLB Home Run Derby in Cleveland. To view more information about the game and complete rules, check out the detailed breakdown for the promotion. Because the promo is based on guessing the exact game a player will hit a home run, most of the winner cards issued for 2018 Topps Home Run Challenge Baseball have low print runs. Each card is serial numbered and covers an entire month of HRC action with a different color for each month. However, the first batch combines results for March and April. 50 cards. Found in 2018 Topps Series 1, Series 2 and 2018 Allen & Ginter. 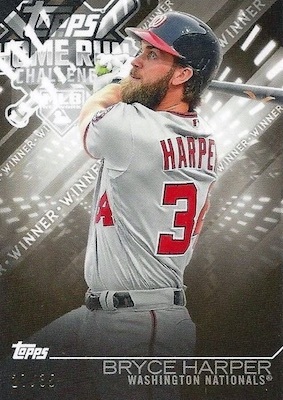 Shop 2018 Topps Home Run Challenge cards on eBay. Shop HRC Winner cards on eBay. (10) 2018 Topps Home Run Challenge September Winner Lot Bryant Contreas Machado. I am enjoying the interaction aspect of this set. The numbers Topps released (and echoed above) contradict the cards themselves for Trout and Encarnacion. You can look on ebay and see that Trout that is listed with a PR of 45 is numbered to 46, likewise Encarnacion is stated to have 18, but the card shows 19. I also question the Wil Myers PR because not a single one has shown up for sale, yet it shows there are 7. Even Bruce and Schoop (print run of 2 and 3 respectively). Maybe they were all won by non sellers, but until I see one I am going to have my doubts on the stated PR. Thanks for letting us know, Andy. The list is now updated to reflect the actual print runs for Trout and Encarnacion. Predicted a Giancarlo Stanton March/April card /17. Yet to receive it. Some folks already have their May parallels. How can I not give it 5 stars, I actually won!!! I just won last night thanks to Mike Trout’s dinger off of Jon Gray. If this is Trout’s only Home Run in August, will that mean there’s a lower print run of the winner cards? When will we see checklists for July, August, and September winners? There was a group of us on BlowoutForums tracking the print runs based on cards showing up on the secondary market or received by each of us.